22/11/2018 20:05 / 2 Comments on #howtowrite: paper or computer? I sit down at my desk in Vienna to continue writing my current novel, code-named The Boyfriend. Outside, birds sing in the trees; all is well in the world. When I start to write, do I reach for my computer? Or for my pen and paper? Many authors write first drafts direct on their computers, or always write on paper, without thinking too much about which works best. Here are a few things you might want think about. In 1986 my then-employer acquired its first computer. I was thrilled by the idea that I could move words around on a screen, and only print them out when I was happy with them. It seemed to make the creative process less daunting. I started to write my first novel, Biotime, on that computer the same year – after work, of course. In 1987 I bought my first home computer, an Amstrad PCW. Later I bought PCs; then Macs. But over the years, I stopped writing fiction on the screen. I write all my short stories and novels in long-hand. How do I do that? And why? You are an author. You are about to sit down and begin to write a story. How do you get started? What will it be about? Where do you get your ideas from? At my reading this week from my Berlin thriller Blood Summit, someone asked when I found time to write. 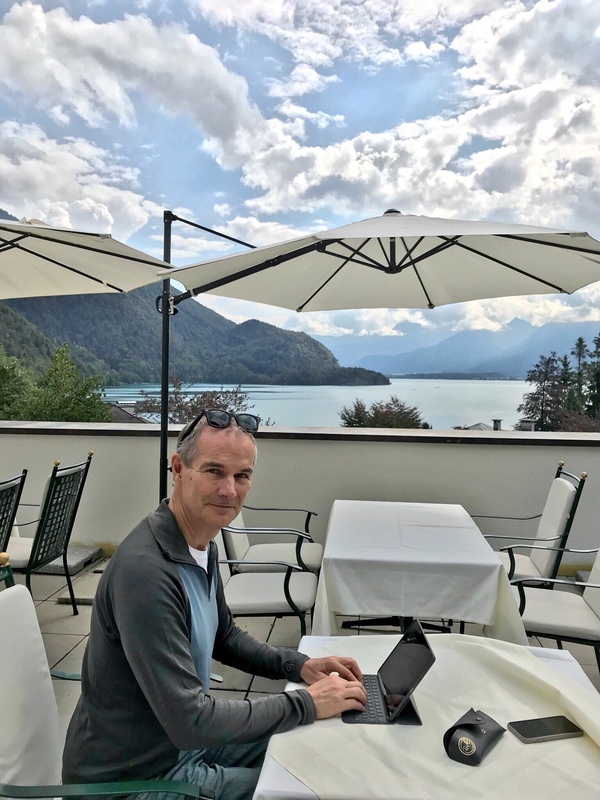 I wrote a blog on “Where I write” recently. A blog on finding time to write is a fine idea – I have added it to my list. Because, it’s a bummer. Finding time to write is hard: lots of other things I dearly want to do, dear friends, dear family, dear visitors, and a job which I dearly want to do brilliantly. Sometimes things don’t work out. Like, this week, I have been away from home all day Friday and Saturday and a bit busy and haven’t got around to writing my planned blog. So. The rather awesome J K Rowling wrote swathes of the “Harry Potter” series in cafes in Edinburgh. Can other writers do this? With iPad at the Wolfgangsee. When I am writing major pieces – such as a novel – I write in longhand, in an A4 pad. While typing straight onto a keyboard is in theory quicker, I find sitting staring at a screen for long periods makes my brain melt. Making quick amendments to what you have already written is also clumsier, and slower, on a computer.